​In a world of sugar and candy, these undead-donuts will swarm you by the baker’s dozen! Armed with a marshmallow blaster, you are the last line of defence against the sugary hordes in the Vancouver-based Studio’s New Release Zombie Donuts. Virtro, a virtual reality game studio founded by female led duo, Jordan and Lee Brighton, has launched the game Zombie Donuts for Samsung Gear VR and will soon release on the Oculus Go when it enters the market later this year. Face the evil donuts in waves over 3 different levels. 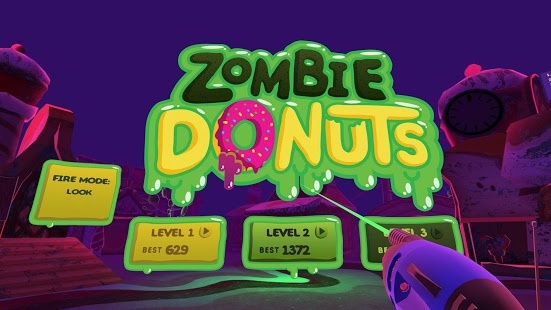 In each level, zombie donuts will sneak up on you from every angle, in this immersive 360 experience. Master your aim and manage your ammo to score extra points with long, bounce and trick shots. Whatever you do, don’t let them touch you. Zombie Donuts launched on Samsung Gear VR in the US on April 2 at a $0.99 price point, and is also available for on IOS and Google Play for Cardboard VR. Oculus Go support will follow very soon. Virtro aims to be a leading game developer in the virtual reality market. With one of the most talented teams in the industry, they are releasing fun and immersive games across various leading VR platforms.